If you have a dog that likes to get out of their designated area or one that gets lost often, you may need to put a GPS tracking device on them. Even as a precaution for pets, these mechanisms are a good idea to help you find them quickly if the situation ever happens. 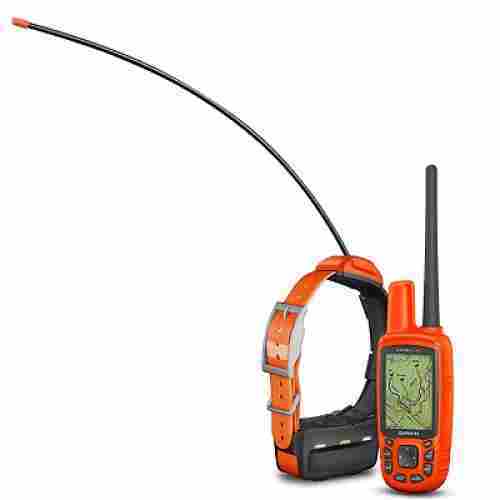 Manufacturers have created some unique GPS products that are just for tracking dogs and that attach to their harnesses or collars for convenience. We feature the best-rated and the most-reviewed of these excellent trackers that are judged by online customers as the top products they would purchase again. These are used mostly for medium to large-sized dogs, and even cats, to monitor their whereabouts and even their history of activity. We are excited to highlight these for your enhanced shopping experience in finding the perfect product for yourself and your family. Our new buyers' guide format juxtaposes important features and buying criteria for each and every product we suggest. 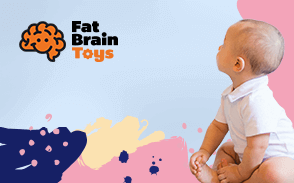 This way, you can decide what best suits your family's particular needs and which product fits that mold. 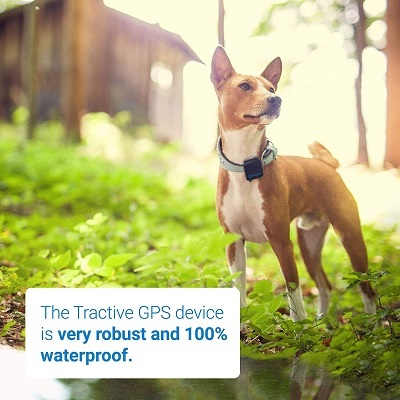 Even when your dog decides to go for a swim, this terrific tracker will still work strong. 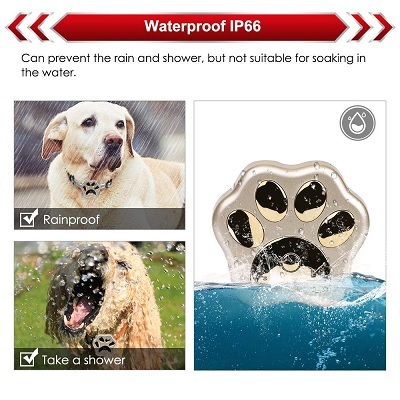 It is waterproof to allow much freedom of use for the pet and the owner wherever you live. You can get notifications in three different ways when your pet goes out of the covered range. Choose from alerts by email, text, or by the downloaded App when your pet is farther away than you want. 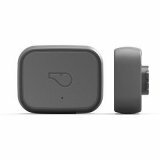 With over 3,800 online reviews from customers, the Whistle 3 GPS Pet Tracker & Activity Monitor is the most popular product of this category. 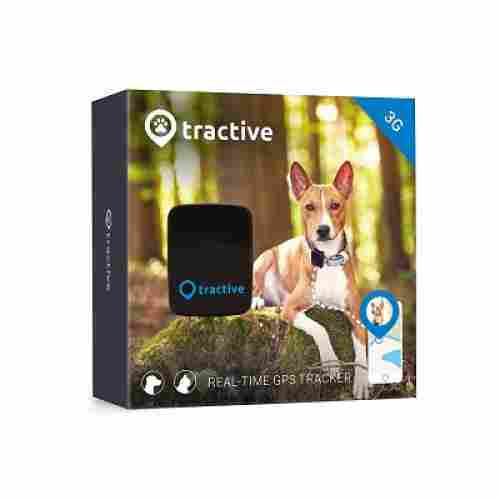 It is the best tracker for cats and dogs available currently and uses AT&T for nationwide tracking. Featuring advanced cellular and GPS technology, the cellular connectivity is provided by a monthly subscription plan for use and works with most IOS and Android phones. When the pet leaves the protected area, you will receive notifications by email, App, or text. 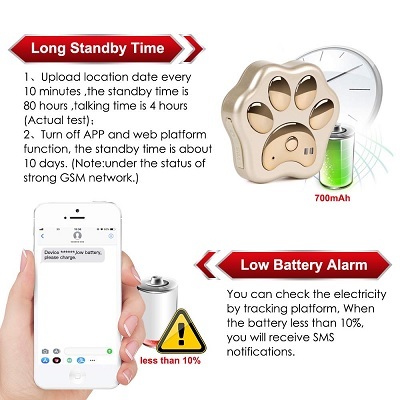 It allows you to monitor the previous twenty-four hours of the pet’s activity and has the longest battery life of all devices with seven full days of constant use. Recharging only takes up to two hours, and it sends notifications to you for low batteries. You can program safe places using the Wi-Fi with alerts, plus find and track the pet anywhere and anytime. 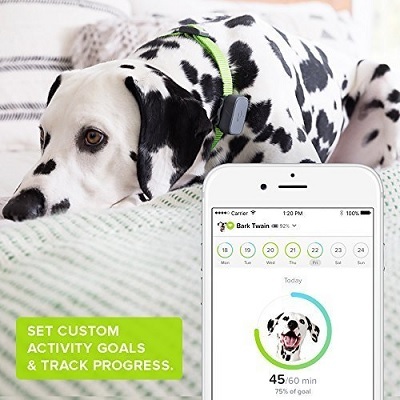 Track the pet’s progress and set goals of activity for them easily and quickly. 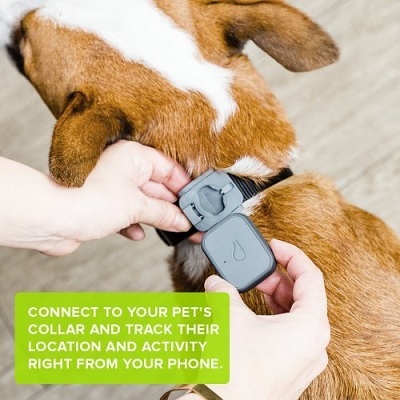 The product includes one collar attachment, the pet tracker, a charging cable, and a user’s guide. It is waterproof, durable, and will attach to any harness or collar that is one-inch wide or less. This incredible item will go anywhere the pet goes, even when they go swimming and is best used for animals that are over eight pounds in weight. The price for this terrific item is below the calculated average. It is valued for its nationwide coverage, long battery life, and ability to send notifications by several means. This is one of the better GPS trackers when weight is considered. Most of the other products will only work for heavier animals of at least eight pounds, whereas this one will fit animals five pounds and over. You can put three animals on this same system to track them all at once. You purchase more tracking tags and add them in for separate monitoring of their locations at the same time. No cell or GPS network is required for the Eureka Technology Marco Polo Advanced Pet Monitoring Tracking and Locating System. It is completely self-contained and great to use for traveling with pets. 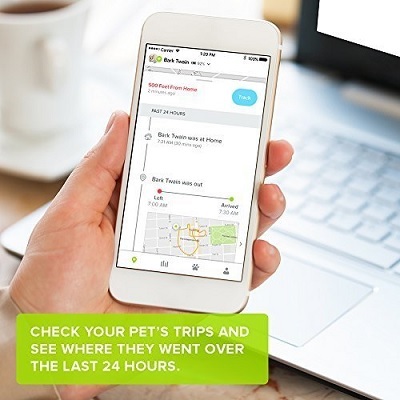 Requiring no contracts for service, this ideal product is simple to use and set up, plus gives real-time direction and distance feedback when searching for the pet. The wonderful system can handle up to three pets by expanding with more tracking tags. Rugged for active dogs and light for delicate cats, it is waterproof and can withstand prolonged swimming. 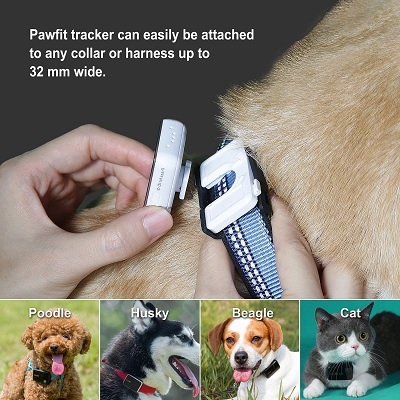 It is perfect for animals weighing more than five pounds and will track, monitor, and locate your pet. Working well for small, medium, and large dogs and cats, the device checks on the pet every forty seconds when it is on. It gives an alert if the animal goes outside of the safe zone and works even inside garages, homes, and backyards. Having an above-average cost, this great tracking device is self-contained to work without a service or Internet, is waterproof, and will tracks all sizes of cats and dogs well. The Garmin TT 15 Dog Device has beacon LED lights and features a rescue mode and stimulation levels of vibration and audible tone. The battery life is twenty to forty hours, and the range is nine miles. It is a highly sensitive device that is waterproof up to ten meters. You certainly do not need any extra hardware or tools to install or use this incredible product. It comes with everything you need including the chargers for various places and the hardware and tools to put it on. 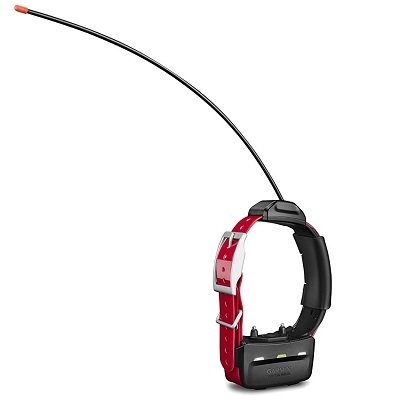 This Garmin product comes with a rechargeable Li-ion battery, a collar strap in red, a charge clip, two range antennas, a power cable for a vehicle, an AC adapter, tools, and a manual. It gives momentary and continuous stimulation in eighteen different levels for your convenience. With a wide nine-mile range, your pet should never be lost without you knowing exactly where they are. Even if they are gone for an extended period of time, they will not be able to get out of this range quickly. The price for this great item is above-average. It has the terrific qualities of a long battery life, a large range of operation, and plenty of accessories for charging and using the device. 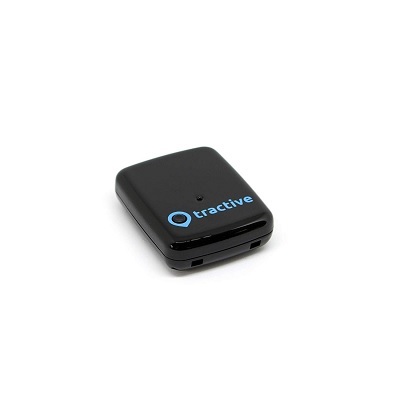 Tractive is a great worldwide option. It's pretty universal and so can be used across most of the globe. It also is easy to use and allows you to track your pup in real-time. This chip easily attaches to any pet collar. 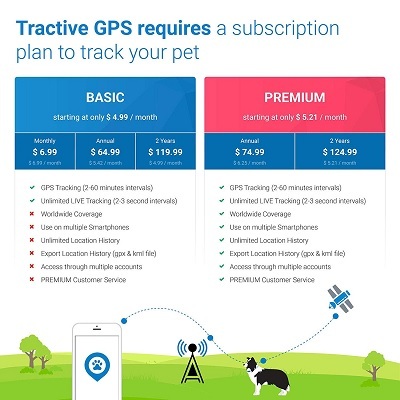 A subscription plan allows you the best cellular service for location and you can define a safe zone for your dog to stay within the boundaries of. You'll be notified if they leave that area. 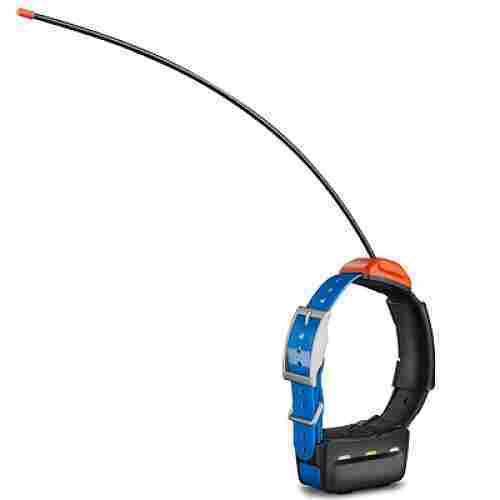 This tracker is lightweight and best for doggies around nine pounds or more. 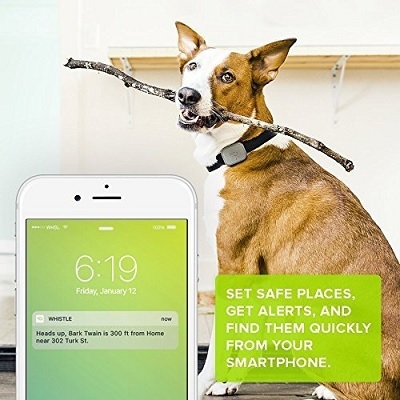 It features real-time location tracking so you'll always know where your furry friend is. It's waterproof and can be used in over 150 countries. This is certainly one of the most cost-effective options on our list. You'll also need to purchase a subscription plan at $5/month so factor that in when considering cost, but this is certainly a smaller initial investment. Your pet can go fairly deep in the pool or in natural bodies of water with this terrific tracker on. It can withstand the water pressure of up to ten meters if your dog swims down that far. 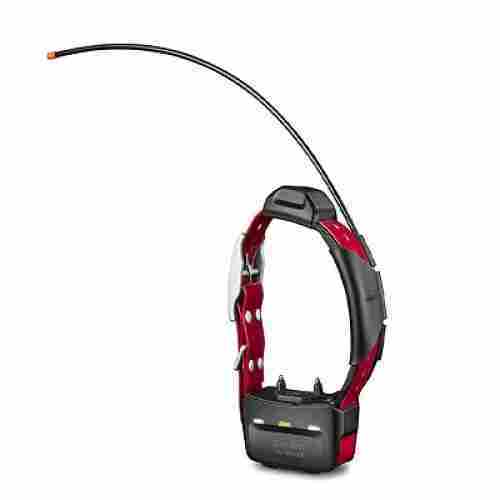 With a nine-mile range of location, the Garmin T5 GPS Dog Collar is a highly-sensitive device with GLONASS. 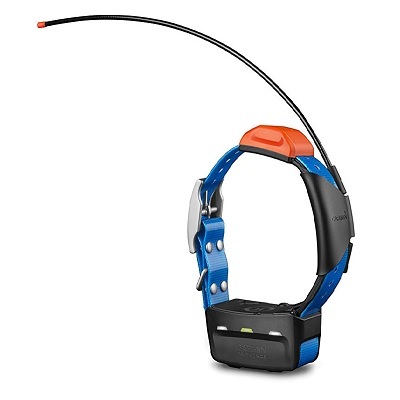 It includes a rescue mode, beacon LED lights, and a collar strap in blue. You can use one of the two included antennas for your pet tracking. Choose the regular one for usual monitoring of a shorter range or the extended range for the wider area of tracking. The neck size is a minimum of 9.5 inches around with a twenty to forty-hour battery life. Waterproof up to ten meters of pressure, this great item comes with two antennas of extended range and regular range. It includes a charge clip and a Li-ion battery, plus works well with both the Garmin Alpha 100 or the Astro 320 models. With a price that is above-average, this wonderful item is valued for being waterproof for a deep depth, having a long battery life, and including two various ranges of antennas. This incredible mechanism is almost indestructible because it is not harmed by water, dust, or damage. It can be dropped or even chewed on without any harm coming to it. There are so many alerts that will go off for terrific reasons while your pet wears this product. If the tracker is removed, the temperature changes, or the safety zones are crossed, you will be alerted. 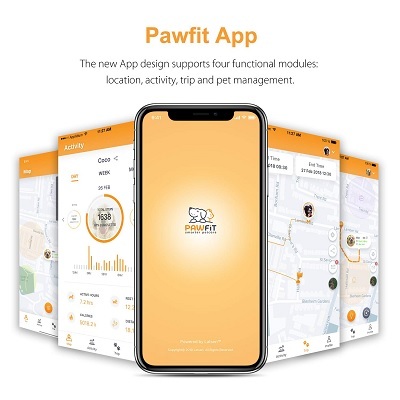 The protection features include the pet’s ID to be known for anyone that presses the power button on the tracking device, so they can return your pet if it is lost. 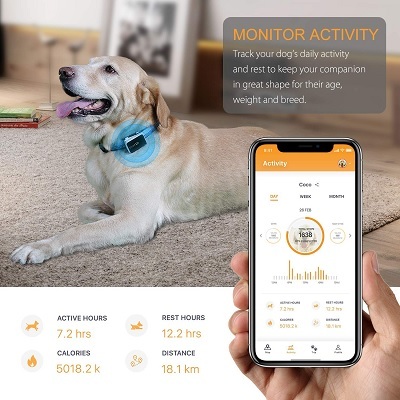 It alerts you if the temperature around your dog becomes abnormal, if the tracker is taken off the collar, or the dog crosses over one of the safety zones. 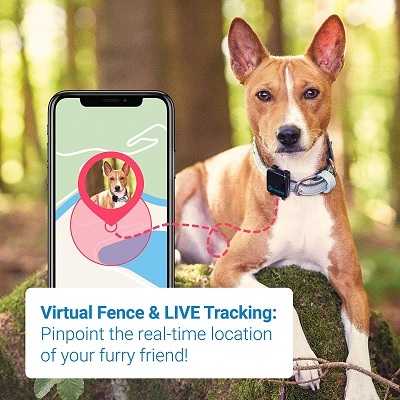 Compatible with most Android and IOS devices, it shows the location and activity of the animal and won’t be harmed if dropped or bitten. 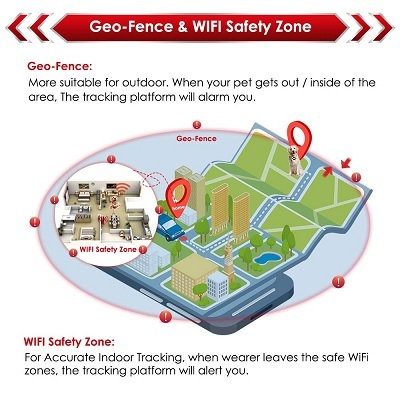 You can set as many as ten zones of safety and monitor as many as four pets with the App and your phone. The battery life is up to ten days for standby and up to six days of normal use. It is great for pets over seven pounds in weight. 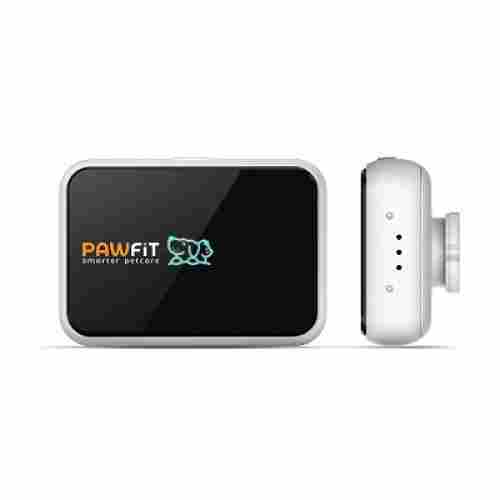 The Pet GPS Tracker and Activity Monitor uses optimization algorithms that are advanced, cellular and Wi-Fi technology, and GPS to give the most accurate and quickest service for tracking pets, It works with the SIM card from Nano and keeps track of the pet’s rest hours, active hours, distance, and calories burned using the weight, breed type, steps and age of the animal. Recording for as many as seven continuous days in a row, it only supports networks of 2G and is waterproof, dustproof, and lightweight. The price for this terrific product is below the calculated average. Its value is derived from the many items it monitors, the several alerts, and the durability of the strong device. To make the location detection very easy and quick, this fantastic model comes with preloaded US maps. You should be able to find your dogs anywhere they could possibly go within the nine-mile range. Used largely for hunting dogs and their locations, this incredible device can monitor up to twenty dogs at once. This is remarkable as they are all color-coded in the device for easy monitoring. 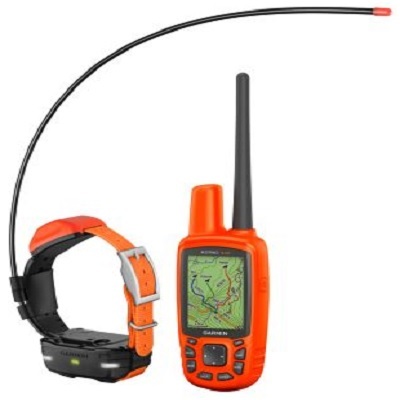 Track as many as twenty dogs with the Garmin Astro 430/T5 Dog tracking Bundle. It has a maximum range of nine miles and can track in environments that are more challenging than normal with just a GPS. Highly-sensitive with excellent satellite reception, it features preloaded US maps and comes with a free subscription for one year for the satellite birds eye imagery. This Garmin item indicates time afield and distance traveled for training dogs and is powered by the rechargeable battery included or with AA batteries. The battery life is as much as twenty hours, as this wonderful device transmits the pet’s location every two seconds. It has a built-in compass with a needle for each dog indicating their direction and is best used for hunting dogs to discover their hunting patterns and ranges. This is the most expensive item we feature on this page. It is valued for is versatility to track as many as twenty dogs, use in difficult environments, and its large range of location. The LED light on this fantastic product will shine in the dark. This helps a lot if your pet ever gets out at night and is roaming around in the dark. With just the GPS, it would be hard to locate them without the light. When your pet is home alone, you can speak to it through this tracking device. This is a comfort for both the pet and the owner to keep the dog calm and feeling safe where it is. 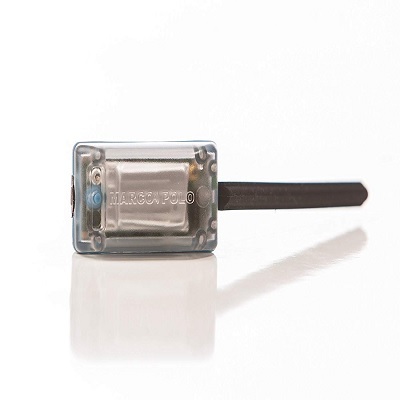 The Autopmall GPS Tracker for Dogs is waterproof but not for swimming or submerging in water. It is best for large and medium dogs, as the location is tracked either periodically or in real time. The LED light will flash when it gets dark on this amazing mechanism that uses the Internet and an App to do the tracking. It includes a low-battery alarm and safety zones using Wi-Fi and works with a SIM card. This great tracker offers geo-fence, voice monitor, global location, and trajectory playback, plus has a long time of standby. 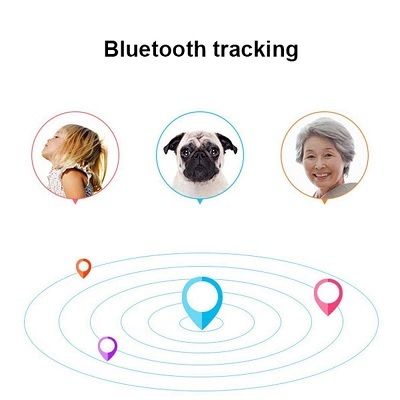 It gives historical routes that your pet has taken in the past ninety days and allows you to speak to your pet when it is at home alone. With a below-average price, this fabulous tracker device is valued for its voice option to speak to the pet, the LED light for nighttime, and the alerts of the safety zones and low battery. The accompanying App that is available with this great product allows you to use the alarm system, the pinpoint map, and the camera function for a complete GPS experience. You can use these GPS trackers for much more than just pets. They can be used to monitor and find personal items too, such as keys, your wallet, and your cell phone. 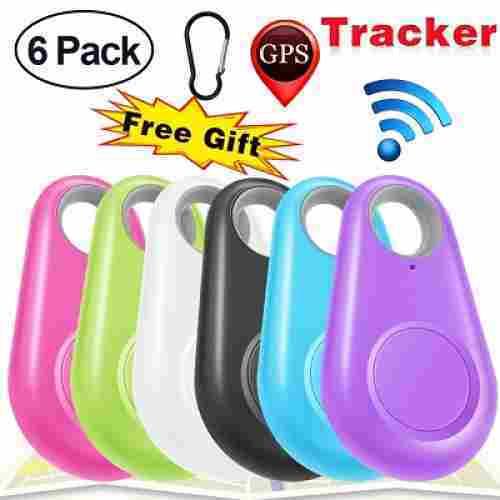 This terrific product is a four-pack of trackers that can be attached to other items as well besides pets, such as keys, a wallet, and a phone. 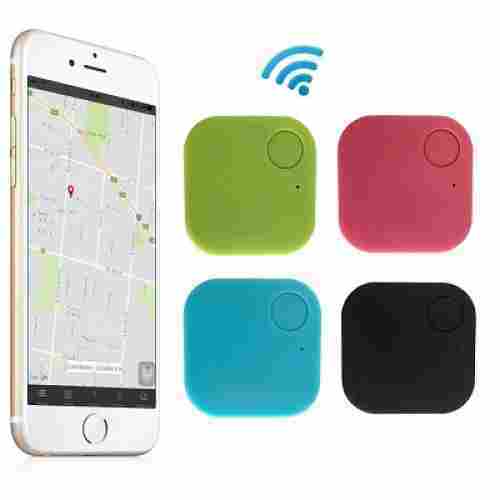 The Xenzy Bluetooth GPS Trackers have a range of 75 feet or 25 meters and are light and easy to install. When the tracked item is not in the range, the phone and the device will warn you. 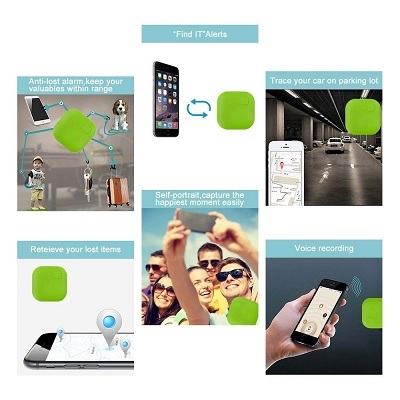 Good for all IOS and Android systems, these fabulous trackers have a map built-in to the device to locate the last point where an item was recorded. This product allows you to retrace the steps where it was last detected. They have a remote control for the voice recording or camera on a phone with the click of a button, and selfies of wide angles can be taken from cameras. These items have an alarm for lost items that gives a map location using the App to recover them. All six devices are different colors to help identify them for various purposes. They have a stylish and well-built design, plus the App is easy to use and navigate. The price for this fantastic item is below the calculated average. It has the amazing features of having more than one device in a pack, being different colors for identification, and is usable on a variety of items. You get four compact and lightweight monitors in this set of trackers. They are all different bright colors, so you can identify them easily and know which ones you put on certain pets or things. 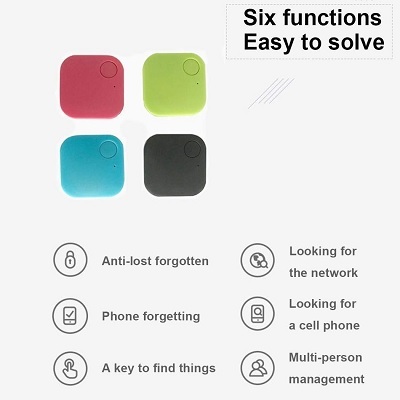 The design is lightweight and compact and aids in locating lost items or pets with the App maps. Download the App and connect to your phone. It will give the last location of the pet or item when it was lost. Use the voice recording of the phone or device camera with the remote control to take photos and selfies. 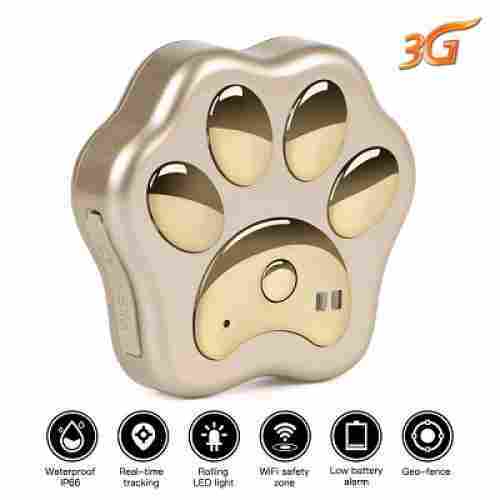 This wonderful product is a four-pack of monitoring and tracking devices that will locate pets and other objects such as keys, phones, vehicles, and kids. All of the Smart GPS Trackers for Dogs are different colors for identification purposes with a calling button to emit a sound for location. These great trackers have plenty of uses for almost everything you own. They work splendidly on pets attached to their collars or harnesses but can also be clipped to children and vehicles among other things. 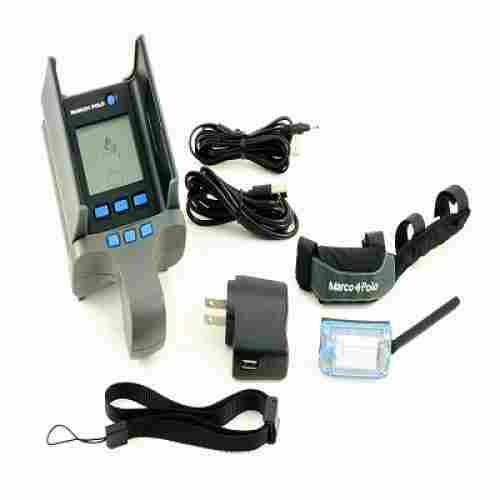 This great item has the lowest price of all the GPA trackers listed. It is valued for its different colors of the four devices, the downloadable App, and its versatility to use on objects as well as pets and kids. All of these great trackers are simple to use and install. Some of them work without any connections to make to Wi-Fi or a network, but some of them do. You will have to connect to a network or service if that is required before the device will work. Other mechanisms listed here are self-contained and do not require anything but the device or possibly a cell phone to monitor the device. Using them is just as simple as tracking on your phone with the Apps and maps the services provide. Each one of these terrific products is for tracking a pet that is loose or lost in the surrounding area. Some of them can also be used for lost items or even children if they are pinned on them or attached. For tracking a pet of either a cat or a dog, you simply attach the device to their collar or harness and monitor it. these all have weight and neck size minimums, so small dogs and cats will not be the best candidates for these tracking devices. One of the models even states that it is for large and medium dogs only. The products may be too heavy for the smaller bodied animals to carry well around their necks. Although we do not list specific prices in our buying guides, we want to give you an idea of a product’s cost. To do this, we calculate an average using the current online prices and compare it to each individual price. You will see in each Cost and Value section that the item is either average, above-average, below-average, the most expensive, or the least expensive in cost. 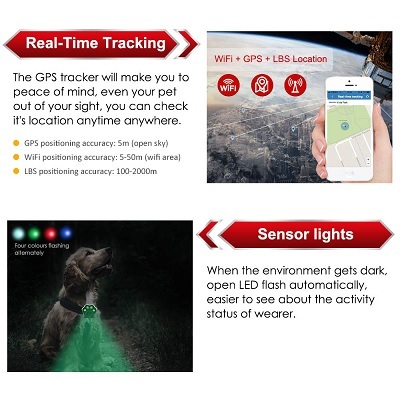 There are no average-priced items for this list of dog GPS trackers because the price range is large. The most expensive item, the Garmin Astro 430/T5 is so much more expensive than the Four-Pack Smart Trackers, which is the least in cost. when comparing the prices of these products, please know that they differ in the number of trackers per package, capabilities, technology, and range of distance they are effective. 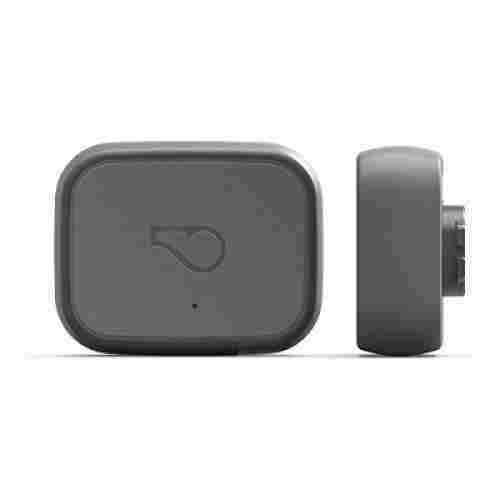 The Dog GPS tracker with the most reviews is the Whistle 3 with over 3,800 online reviews. The product with the highest rating is the Garmin TT 15. We not only tell you which products of a category are the best but give you all the reasons why they are the most excellent one available. Some of these trackers are a flat fee and some require subscription services to operate. A few also will need a SIM card that isn't included in the initial bundle. Make sure you factor in all of these points when comparing cost and ease of use! 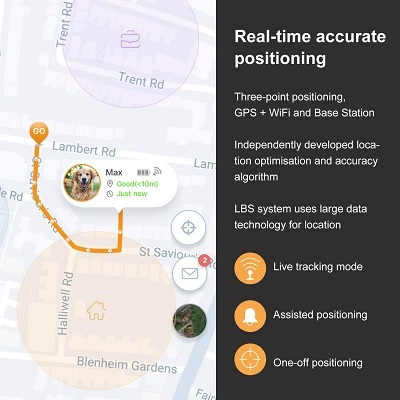 While some of these devices for tracking have a range of many feet, others can find a dog miles away from where they should be. Some of the ranges were not given for the products in the manufacturers’ descriptions, but we did list it when the range was given. Depending on the area that your dog has for roaming, you may want one with only a short distance rather a longer area. The amount of time that the dog would be undetected or lost would also affect the necessary range needed to find them. q: Why do these items differ so much in price? The range of location is wide, as well as the battery life for all of them. Some are self-supporting and will work on their own, while others need to hook up to a service provider of Wi-Fi to be used. One of them even requires the user to get a monthly plan for their service. The features and capabilities of all of them are completely different. A few of them come as a four or six-pack of trackers that can even be attached to items that you regularly lose, such as keys, cell phones, and vehicles in a parking lot. We give you all of the details for each item in the informative summary sections for your quick reference. q: How do you know which is the right one to purchase? First, find one that will be suitable for your pet’s size, as they do not all fit every type of pet. The next thing you want to look at is how is the product powered or used. It may need to hook up to a monthly service provider or be self-supporting. The range of location is an important thing also and the provided features that come with the device. q: Do these products work on all breeds of dogs? Are they adjustable for size and dog shape? The smaller breeds of dogs would be too tiny to support these mechanisms on their small collars. These are mostly for medium and large dogs and cats. The collars are adjustable. Some of the products have a weight minimum as well to ensure that the animal is large enough to carry the device. q: What is the basic range that these trackers are effective? The smallest range is 75 feet and the largest is nine miles. These vary greatly with the range of location, the strength of the locator, and the battery life before recharging. q: How do these trackers attach to the dog? Are they all a leash attachment? The devices attach to the collar or harness of the dog. They do not attach to a leash because they are meant to find the dog if it gets loose or is lost. They mostly fit collars that are one-inch wide or less. q: What is a common complaint of these dog GPS trackers? Some people had connection issues mostly with the devices that used Wi-Fi or a connection service. One of the products needed a 2G area of service and another needed a 3G area. It is best to check how these are powered and connected before purchasing any of them. You might not have the service in your area that they require. q: Can these be used on other animals too, such as cats? Yes, some of them can be used for cats too, but be aware that most of these devices do have a weight minimum. This would exclude some smaller types of cats and even smaller dog breeds. A few of these trackers are also usable on vehicles, children, keys, wallets, purses, key, and cell phones. We give you that information when it was provided by the manufacturer.